Catsharks occur in warmer seas all over the world and are the most common and numerous sharks in many tropical and warm temperate regions. Catsharks are generally small, usually less than 2 ½ feet long (80 cm), and have cylindrical bodies, tapered at the ends, with two small dorsal fins set far back down the body. Their elongated eyes have a cat-like appearance and sit high on the sides of their head; a rudimentary nictitating lower eyelid helps protect those eyes from damage. Slow-moving carnivores, catsharks use their teeth they have from 40 to over 110 rows—to snag and feed on bony fish and small invertebrates like octopi and squid. Although some bear live young, about 90 percent lay oddly shaped eggs with almost fully developed young. 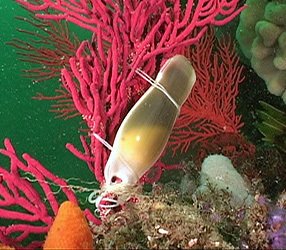 The egg cases, known as “mermaid’s purses,” have distinctive colors and shapes, unique to each species. On the Agulhas Bank, catsharks have taken that basic model and gone wild. More than 11 species of catshark inhabit the Bank, a broad, 155-mile-wide (250 km) swath of continental shelf off the southeast coast of South Africa, where the Indian and the Atlantic Oceans meet. The waters here are shallow (no more than 330 feet (100 meters)) and temperate, and the most fertile fishing grounds in Southern Africa. In other words, perfect for catsharks. Among the many species are tiny tiger catsharks (Halaelurus natalensis), barely 1 ½ feet long (45 cm), which have a prominent up-turned knob on their snout. The sharks are yellow-brown in color, with pairs of broad, vertical, dark-brown stripes on the body. Also wearing a suit of stripes is the much larger pajama catshark (Poroderma africanum), a nocturnal predator with seven longitudinal stripes down its back. Other sharks have gone for a polka-dotted theme. The yellowspotted catshark (Scyliorhinus capensis), which can be up to 4 feet long (1.22 meters), has bright yellow or golden spots on a dark grey body, with irregularly shaped blotches forming “saddles” down the back. 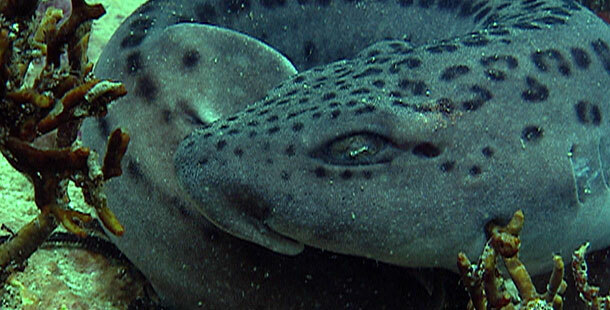 And the stocky leopard catshark (Poroderma pantherinum), a finback catshark, has highly variable color patterns, with black spots, rosettes, and lines in horizontal rows on a grey to whitish background. As its name suggests, the smalleye catshark (Apristurus microps) has peculiarly small eyes. Unlike its colorful companions, this stout, 2 foot-long shark is plain, uniformly black or dark brown or grey, with no markings. Other catsharks on the Bank are more unusual for their behavior. True to their appellation, The puffadder shyshark (Haploblepharus edwarsii), brown shyshark (Haplobelpharus fuscus), and Natal shyshark (Haploblepharus kistnasamyi), will cover their heads with their tail when threatened, as though they are hiding. The largest of the three shysharks, the brown (up to 27 inches (69 cm))—which is actually more yellowish than brown—inhabits the close inshore waters of the Bank, often in shallow, rocky areas, where it feeds on lobsters and crabs. Its kin the puffadder shyshark, a somewhat smaller species (up to 23 inches long (59 cm)), lives farther offshore, in deeper waters. The sandy brown shark has seven reddish brown saddles bordered in black and numerous dark brown and white spots. The smallest of the trio, the less-than-20-inch-long (50 cm) Natal shyshark, was once considered a geographic variant of the puffadder; it lives even closer to the shore, sometimes venturing into the surf zone. Among the oddest of the catsharks of the Agulhas Bank is the balloon shark, Cephaloscyllium sufflans, one of a group of catsharks known as “swell sharks.” This odd, pale grey-brown creature, which can be over 40 inches long (110 cm), lives in areas with sand and mud bottoms. When disturbed, the balloon shark shows off its parlor trick: the shark pumps large volumes of water into the forward part of its stomach, and expands in diameter up to two times its normal size.